Belly Cast - All Your Questions Answered! Belly casting is becoming one of the more popular prenatal spa offerings for moms-to-be. Also called belly masks, tummy masks, pregnancy life casts or pregnancy body casts, these three-dimensional sculptures offer a great way to memorialize your pregnant form. Have a bellycast made during your babymoon for a great souvenir of your pregnancy and your pre-baby vacation. Want to know more about belly masks? Check out our FAQ below. What exactly is a belly cast? Bellycasts are made by covering the pregnant tummy with layered strips of wet plaster gauze. After setting for 20-30 minutes, the cast is lifted from the tummy and air dried for 24-48 hours. The bellymask can then be left in its natural state or decorated using any number of finishes or designs. When is the best time to make a belly cast? Most women choose to have a tummy mask done in the 7th or 8th month of pregnancy. It is also possible to do a series of pregnancy life casts to capture the progression of your pregnancy. When done correctly, belly masking is completely safe for mom and baby. It is important that only medical grade plaster gauze is used. Most professional bellycasters only use medical grade plaster gauze, but you should confirm in advance that this is the material that will be used for your bellymask. How long does it take to make a belly cast? The length of time required to make the cast depends on the pose that is chosen. A belly only cast usually takes 20-30 minutes while a full torso could take up to an hour. Clean-up and drying time are not included in these estimates. Can I Make My Own Belly Cast? Absolutely! Manufacturers have made it easy for you to create your own precious work of art to commemorate your pregnancy by putting together DIY belly cast kits. Our favorite kit is the Proudbody Deluxe Pregnancy Belly Cast Kit , which contains everything you need to achieve a professional result, including loads of ideas for decorating the cast. A word of warning - doing your own belly cast CAN be a little tricky and you will need the full co-operation of hubby or a very close friend! But the kit contains plenty of everything, so it doesn't matter if they're a little liberal with the materials, and the instructions are clear enough that following them shouldn't be a problem for anyone. 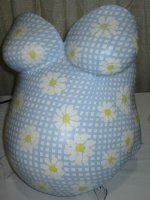 What do people do with their finished pregnancy life casts? Bellycasts can be mounted and hung on a wall, framed in a shadow box, placed on an easel or displayed on a shelf. They can also be turned into functional objects such as a bassinette when lined with sheepskin or a bronzed, decorative bowl. You can keep your belly mask in its natural, white form or paint, decoupage or embellish it with fabrics, ribbon, beads, etc. Your bellycasting professional may offer several finishing options or can likely refer you to local artists who specialize in finishing belly masks. Below are a few examples of creative decorating ideas for your tummy mask. Looking for a way to be home with your baby and earn an income? Read my story.